I was interviewed recently by Bruce Gall who hosts (in addition to his ARFM Sunday Synth) OneWorldMusic: “Atmospheres”. A weekly electronic music radio show. This interview was done via Skype and recorded near the end of June. I admit I was a little nervous. Being interviewed in the form of a written publication is one thing, but speaking is a bit daunting for me. In this interview we had a nice chat about my music and iOS as a medium for creation. We talk about many things including how I started, apps I use, the technology and much more. I hope you find it entertaining, useful, or at least worth your time. Some things I mentioned. “Galaxy Explorer”, Waldorf Nave, Lazer Kat Records, iPadMusician Compilation Vol 2, Audiobus, Galileo, and more. 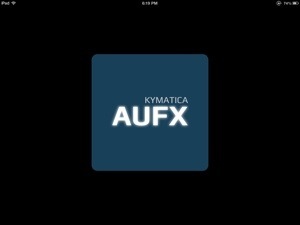 Its been several months since Audiobus was released, changing everything for a lot of people. Since then most every music app worth having has become compatible. Others have not. A lot of excellent music apps have completely missed the bus. Why is that I wonder? Are the developers done? Are the apps dead? What’s going on? Its like they just prefer to walk separate from the pack or are waiting for something else. Some notable apps that have been quiet about their Audiobus plans are: Cassini, iSequence, StudioHD, Borderlands, and everything by The Strange Agency to name a few. Wizdom Music hasn’t yet made any of their apps Audiobus compatible, however they are working to support it in some of their apps soon. SampleWiz and GeoSynth first. I haven’t heard about MorphWiz and SpaceWiz, but seems logical they will follow. Jaroslaw Jacek of BeepStreet (maker of Sunrizer, Impaktor, and iSequence) said recently that he will be revisiting his roots and develop a new app based on iSequence. He added that development will begin once iOS 7 arrives with its “inter-app audio” functionality. That wasn’t an exact quote by the way. Now, I don’t know all the in and outs of the inter-app audio stuff coming with iOS 7, but it seems that it will be yet another major game changer for how we make music on iOS. 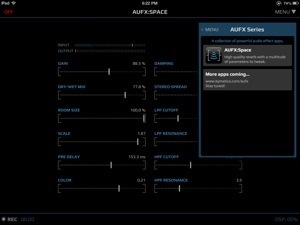 If it does indeed provide an audio connection to and from our music apps, what becomes of Audiobus? Is this what the other developers are waiting for as well? Who knows? It sure is intriguing and there’s plenty to speculate about. 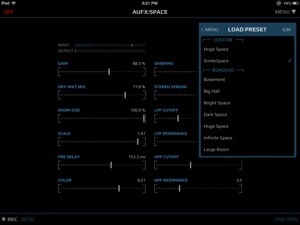 I have no reason to believe Audiobus will vanish into the night. It will probably go in a new direction and evolve into something else just as useful as ever if not more. Maybe it’ll (Speculating!) work over WiFi somehow sending audio and MIDI back and forth between separate devices? Now that would be very cool, would it not? Stranger things have happened. So did some apps miss the bus on purpose, or are they dead? We probably won’t know for sure until iOS 7 is released and developers start talking more about their plans. Whatever the case, there’s much to be excited about in the coming months. Perhaps another revolutionary breakthrough will occur bringing loads of new possibilities, amazing new apps, better and more choices? Like most of you, I’ll certainly be watching closely as things unfold expecting iOS music to once again take us to the next level. Wizdom Music has been designing music apps for iOS a long while now. 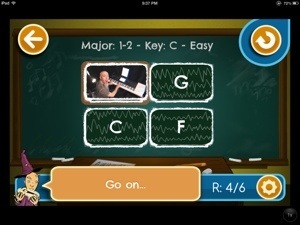 Jordan Rudess is one of the more recognizable names in music to start with and even more so among those who enjoy iOS as a creative option. 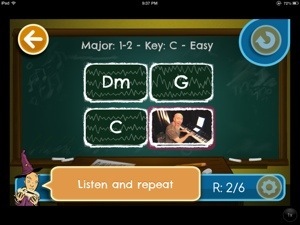 We are used to seeing innovative music apps we can use as instruments or controllers from the Wizdom Music team. EarWizard is something different and, at least speaking for myself, unexpected. 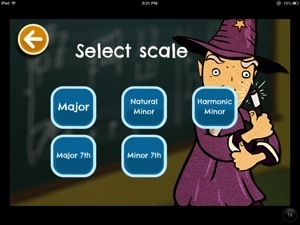 EarWizard is a fun learning tool that helps one become familiar with scales & keys using a take on “Simon”. 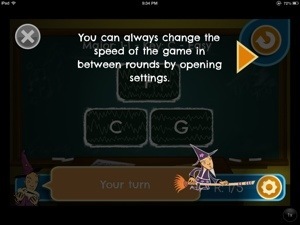 This makes the presentation of EarWizard as a game of sorts immediately understandable. It is familiar and fun while being educational at the same time. 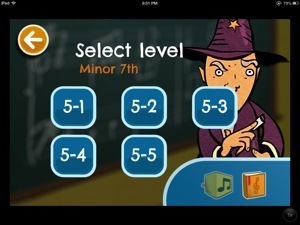 I don’t think I need to describe how “Simon” works, but I will describe how EarWizard puts its own spin on things. 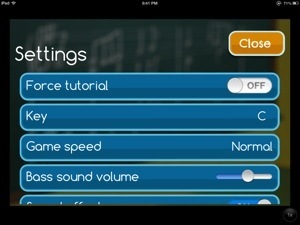 The concept is simple: you can change the key and game speed from the settings or begin with a tutorial. 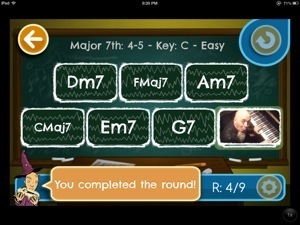 You start off in a particular scale and key. 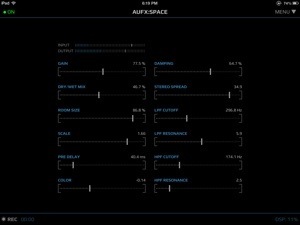 Then select a level. Instead of boring sequences of increasingly complicated tones that must be repeated perfectly, there are windows displaying a short video of Jordan playing a chord. 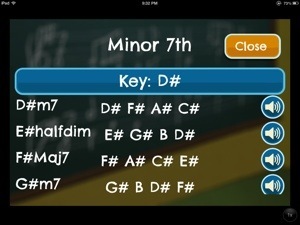 Starting off slowly and then progressing to a more complex series of chords to repeat. Easy enough. Each correct interaction is followed by a pleasant audible indication. Make a mistake and you’ll hear about it with out of tune chords. A clear indication an error has been made. As you play through it becomes more and more challenging. I found that along the way I had been learning to recognize keys. Such is the benefit of this game. What really kept my attention other than just trying to concentrate on recognizing each key, was the videos of Jordan. He makes different facial expressions for each video where he strikes a chord on a piano. They range from benign to hilarious. I found myself a little distracted at times because I ended up laughing at the expressions he would make. I mean this as a compliment. It kept me interested and always looking forward to seeing what he would do next. I really thought that was a great idea, and it works for me. You really gotta just see it for yourself. 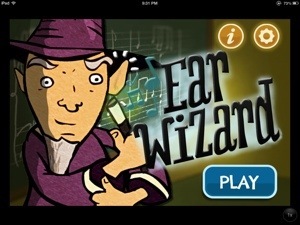 EarWizard is a fun way to either develop or exercise an existing skill and have some fun while at it.